Larne officials have confirmed a boost in the club’s bid towards Inver Park development plans. 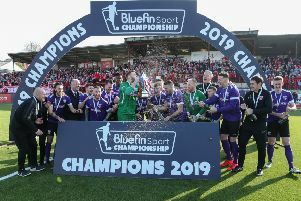 “Larne Football Club have been informed that Mid & East Antrim Borough Council have accepted the option to sell Inver Park, Larne, which of course we are pleased about,” confirmed a club statement on the Bluefin Sport Championship club’s website. “They have informed us that in the pursuit of transparency it has to be offered on the open market. “We don’t agree that Inver Park is development land and shouldn’t be sold as such but that is the decision the council have made. “We are delighted to advise that we can meet all of the sales conditions and we will be submitting our written offer in accordance with these by 15th March 2018. “We feel we are clearly in the best position to purchase Inver Park because one of the conditions is that it must remain as a sports facility and we have no other intention but to develop sports facilities at the ground for all the people of Larne. “Larne Football Club currently have a 19-year lease remaining which will transfer to the new ownership of the land. “This would give us time if we are unsuccessful in our bid. “We are in a fantastic position to secure Inver Park for the football club and the community of Larne and we feel there is an obligation on all involved to do what is best for the people of Larne.